It’s come to this. Oriental bittersweet is now such an invasive plant in the state that the Connecticut Department of Energy and Environmental Protection has issued a release urging residents not to use it in holiday decorating. 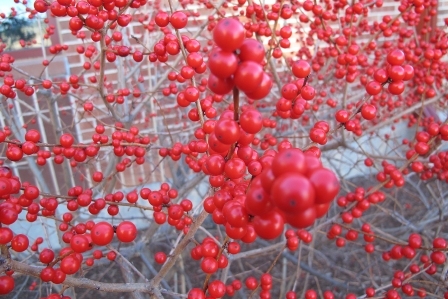 Use a native plant like Winterberry holly (below) instead, DEEP recommends. Sad to say, we have a spectacular mass of the berry-filled branches of Oriental bittersweet high in an immense rhododendron. I admit the berries are gorgeous, and years ago, when I didn’t know any better, I would have been thrilled to use them in a wreath or centerpiece. Now I’m glad they’re out of reach to other holiday decorators who might spot them and be tempted to clip a few. As soon as there’s enough snowcover on the ground, I’m going to try to pull down the mass of berries using a telescoping pruner. I figure the snow will help me spot where they land. For now, I know the birds are feasting on the berries, which only contributes anew to the continuing spread of the invasive plant. For years I’ve chopped at the vines of Oriental bittersweet, which have a vexing habit of wrapping around branches and girdling them. The plant just keeps popping up with a vengeance. It’s a never-ending battle. While it’s not new — it’s been here since the 1860s — and is fairly widespread, there still are parts of the state where Oriental bittersweet isn’t a problem. And that’s why DEEP wants to keep it from spreading. It’s actually against the law to sell or move Oriental bittersweet. A state law that went into effect in 2004 prohibits moving, selling, purchasing, transplanting, cultivating or distributing 80 invasive plants — with fines of $50 a plant. Logan says that while the law has been on the books for a decade, no one could “write a ticket” until 2010 when DEEP was given the enforcement authority. And DEEP does get complaints, but so far, Logan says, they have been resolved with education and voluntary compliance. As far as eradicating Oriental bittersweet, Logan says you can pull up smaller plants by hand — the bright orange roots are easy to identify. A larger patch or bigger plants might require a professional. You can cut plants that have large woody stems at the base and then apply an herbicide (labeled for woody vegetation) at just the cut portion. 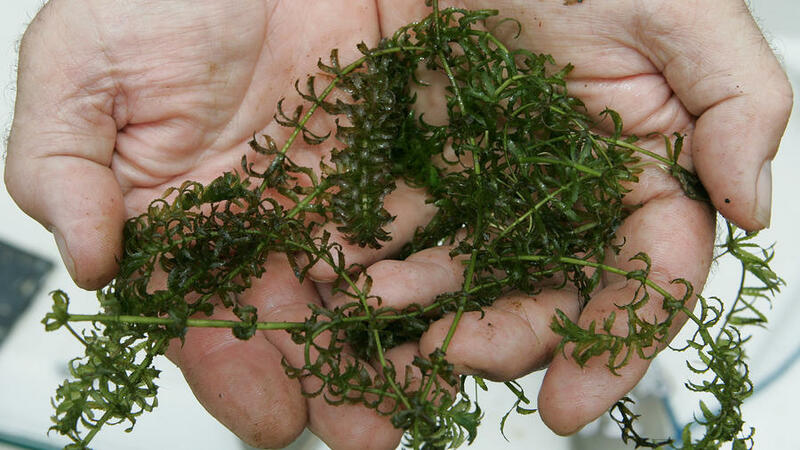 For more information — or if you find someone selling invasive plant species — contact Logan Senack, at 860-208-3900 and logan.senack@ct.gov. And the Connecticut Invasive Plant Working Group’s website at www.cipwg.uconn.edu has lots more information on invasive plant species in Connecticut. 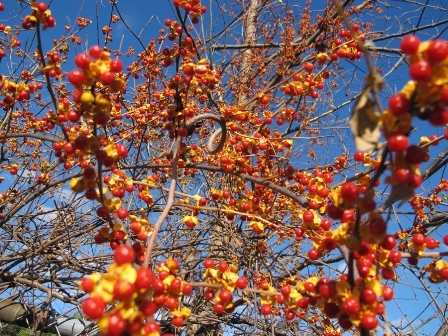 PHOTOS: Oriental bittersweet (Celastrus orbiculatus), at top, and Winterberry holly (Ilex verticillata), both by Nicole Gabelman, via DEEP. Just about every truly serious gardener I’ve met in Connecticut is a Master Gardener; it’s a credential I aspire to and hope one day to find the time to attain. It takes serious commitment. The UConn Extension System’s 2014 Master Gardener program, which begins the first week of January, provides horticultural and environmental training to people who want to expand their gardening know-how and share it with the public through volunteer activities. The program includes more than 100 hours of classroom work — in 14 all-day class sessions once a week — covering botany, plant pathology, entomology, integrated pest management, herbaceous and woody ornamentals, edibles, turf grass, invasive plants and diagnostic techniques. 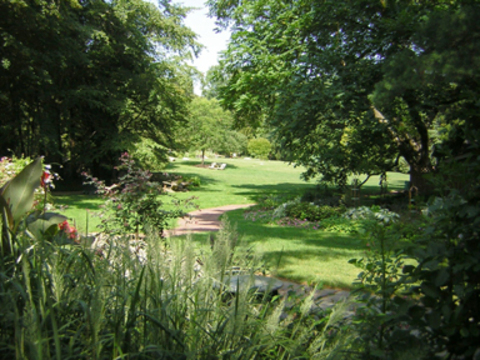 Classes can be taken at the Bartlett Arboretum in Stamford, or at the County Extension Centers in Norwich, Torrington, Hamden or Vernon. Students also do supervised research — on identifying insects and plants, diagnosing plant diseases and providing recommendations — and participate in community outreach projects, such as community gardens, educational booths at Earth Day events and county fairs, and working with the Connecticut Invasive Plant Group. In all, it involves about 60 hours of volunteer work. The fee is $415, and partial scholarships may be available, depending on need. The deadline for postmarking applications has been extended to Nov. 8. Details about the program and the application form are available at the Home and Garden Education Center’s website at www.ladybug.uconn.edu and at County Extension Center offices.